It seems that Steam has added a category in their search that allows you to easily see what games are available in the platform that have support for the Oculus Rift 3D VR HMD and even though the category is called VR Support it essentially means Oculus Rift support for now. And while we may see other games supporting different VR platforms as they become available in the future, at the moment Steam has listed 14 titles in the VR Support category though the number of games is actually a bit different. 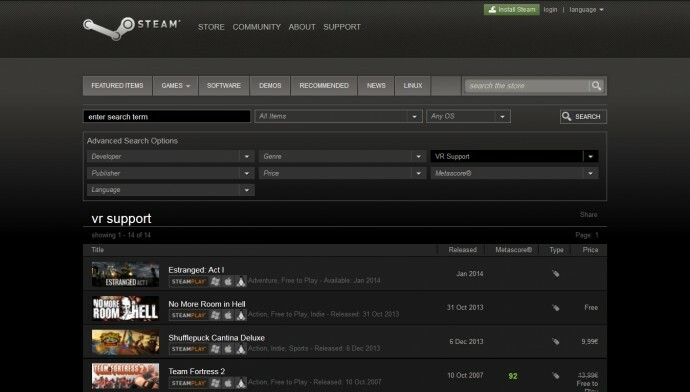 You can see the list if you open the search on Steam and go to the advanced search where you have the option to select category and at the bottom of the category list you will see the new VR Support category. We mentioned 14 titles available under the VR Support category, but the number is actually a bit different as the list includes Team Fortress 2 two times and it is also included in the Valve Complete pack where other Valve games with Oculus Rift support are only available. The game Strike Suit Zero is also available as a standalone in the list as well as in the form of a pack Strike Suit Zero Mega Bundle that includes some extra features. There is also the game Estranged: Act I that is not yet available, but should come out next month that is listed in the VR Support category. A company called Avegant, a name that you might not heard of yet, has just announced a beta consumer concept of what the call a Virtual Retinal Display called Glyph. 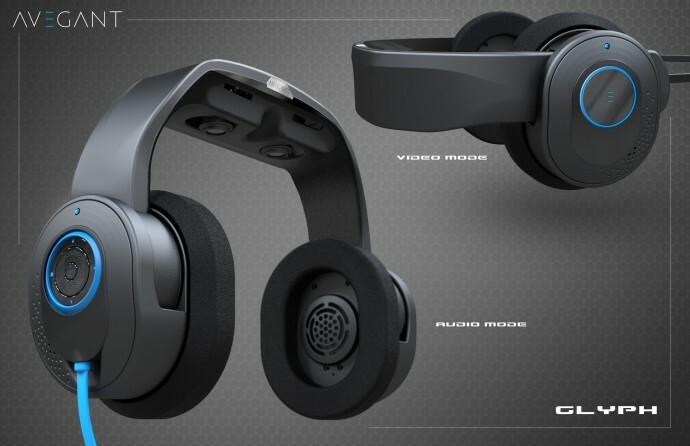 The Glyph headset integrates a brilliant, vivid video display and premium audio experience in a unique flip-down form factor looking just like a pair of headphones that double as a HMD. Prototypes of the Glyph Beta will be featured at the Consumer Electronics Show in Las Vegas from January 7-10, 2014. Consumer units will be available for purchase through a Kickstarter campaign that should start on January 22 and backing it up with $499 will secure you a kit that will ship later in the year. Key to the innovative nature of Glyph is its optical engine called a Virtual Retinal Display (VRD). Using a low powered LED, a series of custom optics and a micromirror array, the visuals produced by the headset are supposedly crisper and brighter than those from conventional display technologies – think in the lines of using micro projectors that project the image directly on your retina. 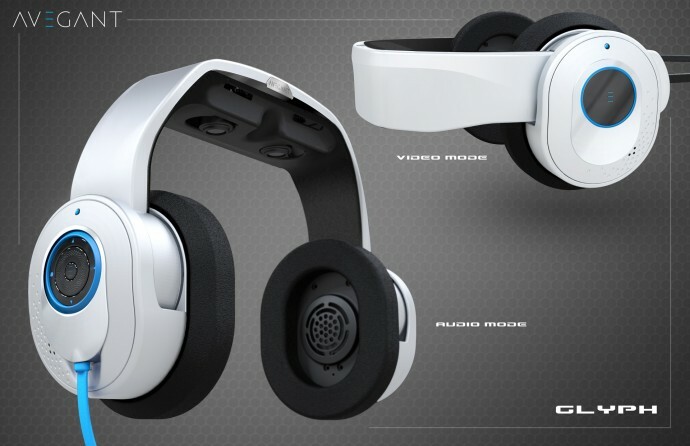 There will also be an integrated head tracking for more immersive and responsive gaming that should be compatible with all of the latest consoles and games according to Avegant and in order to achieve this you should most likely be able to map it to other controls. The shipped version will have one HDMI/MHL cable, onboard battery power and a thinner, narrower display band than the Glyph Beta shown at CES. A Virtual Retinal Display uses a micromirror array and a combination of optics to reflect an image directly onto your retina, effectively using the back of your eyeball as a screen. The resulting picture is extremely sharp and vivid, unlike anything a conventional display can produce. In particular, the 3D images are exceptionally clear. The people that have tried the prototype from Avegant report that even though it had lower resolution of 1280×800 pixels the image quality looks really great and better than what a similar resolution HMD device using LCD displays can provide. You will also have an option to adjust the diopters in the Glyph to accommodate a wide variety of prescriptions and pupillary distances, so no need to wear prescription glasses while using it. The Glyph is made to be media agnostic, meaning that it can plug into any HDMI source and display any current content natively. The beta headset will have one MHL/HDMI cable that will plug into any HDMI source and for the 3D is should be based around the HDMI 1.4 frame packaging format. According to Avegant the beta headset should have enough battery life to power a full-length feature film, or about two to three hours. The Glyph headset should have a 45 degree field of view, so this makes it more like an alternative solution to devices such as the Sony’s Personal 3D Viewers, Carl Zeiss Cinemizer or the Silicon MicroDisplay ST1080 than the Oculus Rift for example. The idea and the technology seems very promising, and Avegant is reporting that many users who experience eye strain or nausea in looking at a conventional display feel no similar effect using this technology. The price also seems just about right and much lower than other higher priced solutions such as some of the HMD devices already mentioned aside from the Rift, but the Glyph will be a competitor for that device anyway. What bothers me a bit actually is the headset design that places the video part on the top of the headphones frame, meaning that if not used for video the optics will be sitting on top of your hair. The concept also shows no means to block external light are available, something that can kill a bit the sense of immersion at least for LCD-based HMD devices, it is possible that with this projection technology that might actually not be a problem, but it is something that needs to be checked. Anyway, I’ll be keeping an eye on the Glyph as more information becomes available about the device, and so should you if you are interested in VR and HMD devices.